This year at the two main festival venues - Wytwórnia & Toya Studios - workshops and meetings will be hosted by the likes of Haydn Bendall, Youth, Andy Jackson, Maciej Polak, Wojtek Pilichowski, Steve Osborne, Łukasz Kruszewski and others. Alan will be around for the Saturday evening’s events, and Paul Kendall will also be in attendance to conduct a workshop on production techniques. As well as various live acts, Eugeniusz Rudnik, the founder of the Polish Radio Experimental Studio, will tell the story behind this legendary institution and receive ‘The Man with the Golden Ear’ award. A further award will be presented to Killing Joke’s Martin ’Youth’ Glover who produced, among others: The Orb, The Cult & Primal Scream. Tim Simenon and Gavin Friday will also be in attendance as special guests. More events are being added as we speak so keep checking for the exact programme and general info about the festival at www.soundedit.pl. Tickets for Soundedit Festival are available at Ticket Pro. As part of the Soundedit ’12 weekend, the latest screening event for ‘A STRANGE HOUR IN BUDAPEST‘ will take place on Sunday October 28th. The live concert film will be presented in Lodz at Kino Baltyk. These screenings accompany Recoil’s Blu-ray release of the full concert film, directed by Attila Herkó. Owned by the Helios cinema group, Kino Baltyk has been around since 1927 and combines tradition with latest technology. 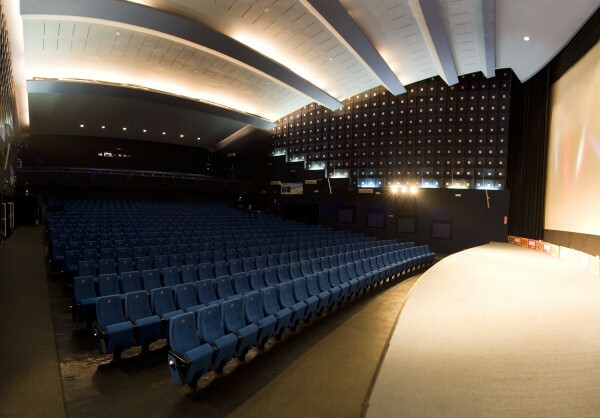 During the communist period in Poland it underwent a massive expansion in line with many of the state-owned Adria cinemas, which left it with its huge main screen and comfortable seating for 700. Baltyk features state-of-the-art Dolby Digital surround sound and it also boasts one of the few curved screens in Poland, making it ideal for the perfect presentation of widescreen features. The Recoil presentation will feature the 5.1 audio mix, and afterwards Alan will host a Q & A session & discussion about the ‘Selected Events’ tour, film project and anything else you want to ask him! Look out for some special signed items for sale – plus other goodies – all followed by an Afterparty with Bar & DJs (more details to follow on that).